This weekend we attended the most lovely RUSTIC themed wedding! With touches of vintage elegance, burlap, and lace in gray, pink, and fallow brown. This RUSTIC font love post is inspired by the fabulous rustic wedding. 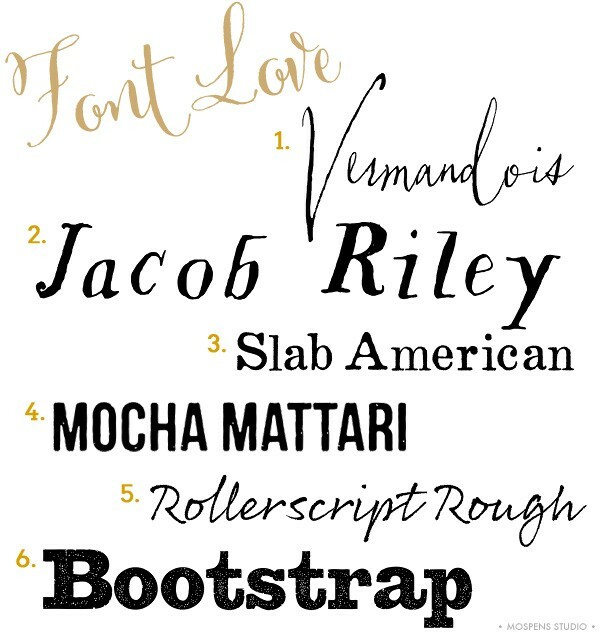 Shown are my top 6 favorite fonts for a rustic themed wedding. Think … hand-written, block stamp, hand-lettered, and vintage / antiqued letterpress styles of types for your rustic country chic wedding. 1. Vermandois – A lovely rustic chic handwritten font. Perfect for the rustic chic wedding couples names! 2. Jacob Riley – Hellooo Jacob! I think I’m in LOVE. Handwritten and NOT perfect. Perfectly rustic though. 3. Slab American – Being the owner of a Heidelberg (Letterpress) Printing Press … how can I NOT love this font? Letterpress inspired. Rustic perfection. 4. Mocha Mattari – Warm and yummy. Hand-stamped inspired java loving font. 5. Rollerscript Rough – Yes. Please. Easy to read handwritten magic. 6. Bootstrap – Bold. Beautifully hand-stamped inspired font. A rustic wedding invitation design must have. Perfect for the country chic couples’ names. Stay tuned and be sure to keep an eye on my blog for my NEW 2014 invitation collection full of rustic chic wedding invitations and designs!